The purpose of this guide is to get you up and running as quickly as possible so that you can play with and test-drive various features that Red Hat Single Sign-On has. It relies heavily on the default database and server configuration and does not cover any complex deployment options. If you want a more in-depth discussion of any features or configuration options, consult the various reference guides available. The 'RH-SSO-7.1.0. [zip|tar.gz]' file is the server-only distribution. It contains only the scripts and binaries to run the Red Hat Single Sign-On server. 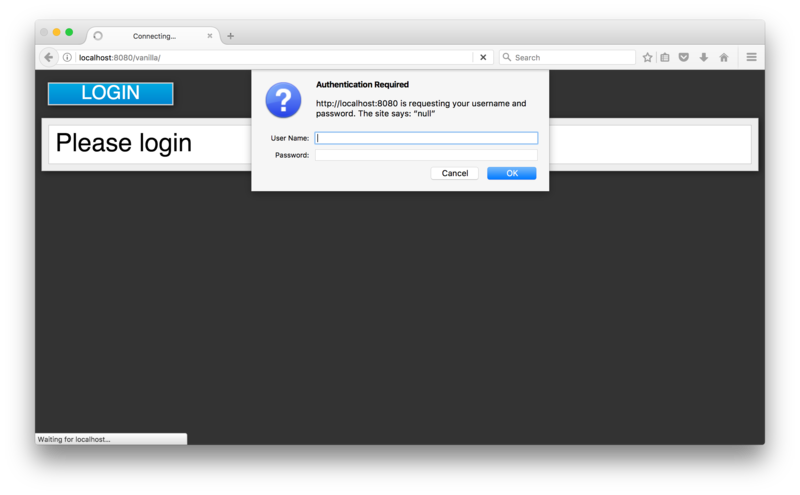 Red Hat Single Sign-On does not have a configured admin account by default. You must create one on the Welcome page. 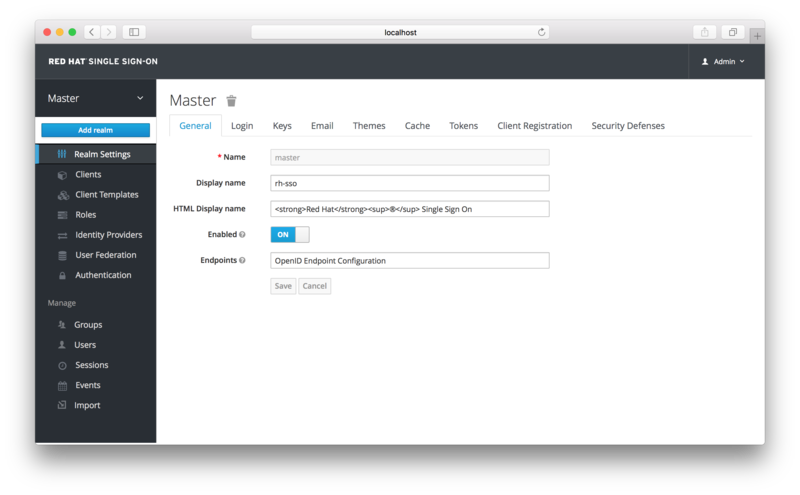 This account will allow you to create an admin that can log into the master realm’s administration console so that you can start creating realms and users and registering applications to be secured by Red Hat Single Sign-On. You can only create an initial admin user on the Welcome Page if you connect using localhost. This is a security precaution. You can also create the initial admin user at the command line with the add-user-keycloak.sh script. For more details see Server Installation and Configuration Guide and Server Administration Guide. Type the username and password you created on the Welcome page. 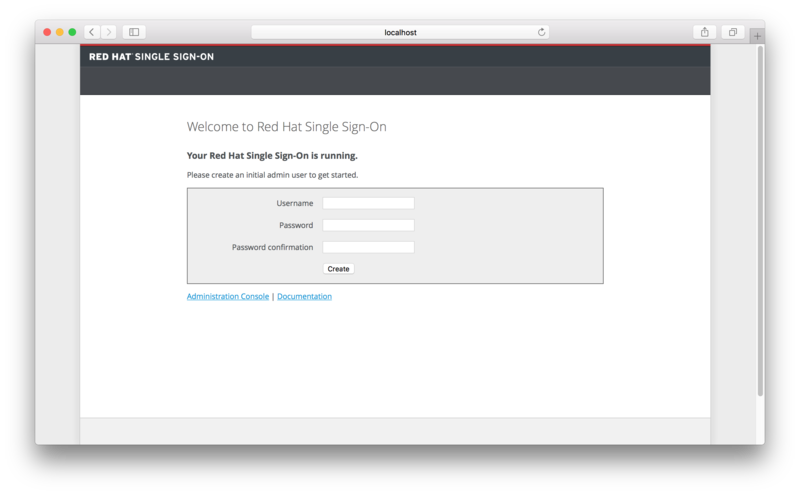 The Red Hat Single Sign-On Admin Console page opens. If you are curious about a certain feature, button, or field within the Admin Console, hover your mouse over the question mark ? icon. This will pop up tooltip text to describe the area of the console you are interested in. The image above shows the tooltip in action. Before you can participate in this tutorial, you need to complete the installation of Red Hat Single Sign-On and create the initial admin user as shown in the Installing and Booting tutorial. 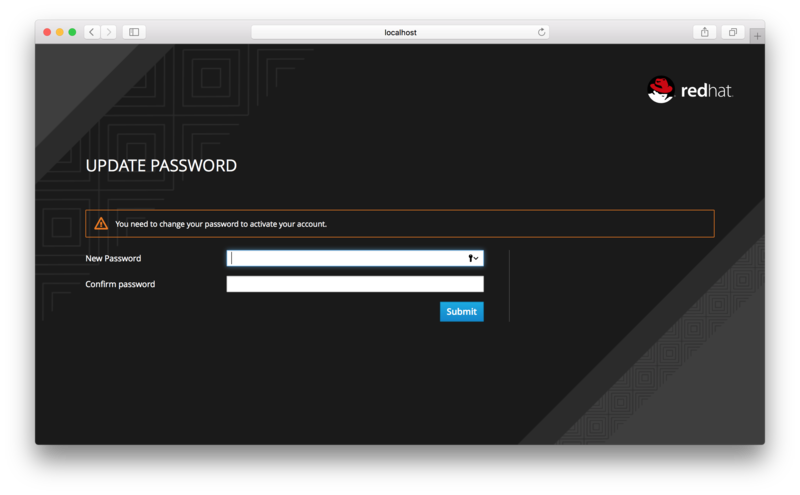 Log in to the Red Hat Single Sign-On Admin Console using the account you created in the Install and Boot tutorial. In the top left corner dropdown menu that is titled Master, click Add Realm. If you are logged in to the master realm this dropdown menu lists all the realms created. The Add Realm page opens. 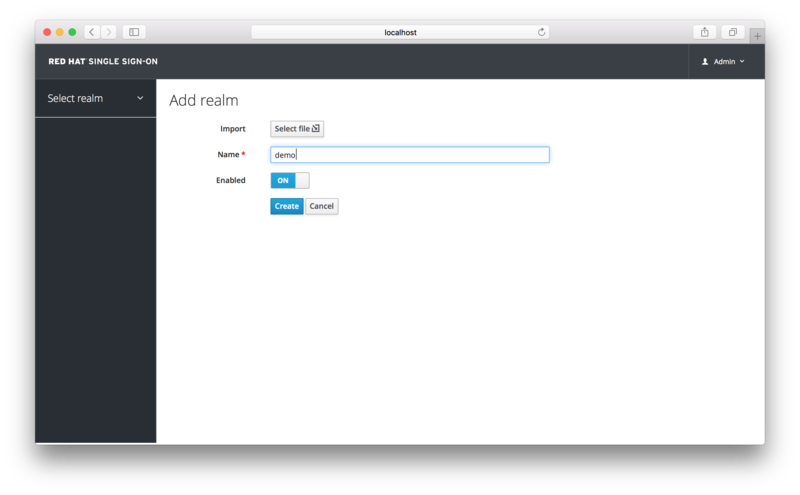 You will be creating a brand new realm from scratch so type demo for the realm name and click Create. After creating the realm the main Admin Console page opens. The current realm is now set to demo. You can switch between managing the master realm and the realm you just created by clicking the top left corner dropdown menu. In the left menu bar click Users. The user list page opens. The only required field is Username. When you are finished, click Save. The management page for your new user opens. The next step is to define a temporary password for your new user. Click the Credentials tab. Type a new password and confirm it. A red Reset Password button is displayed. Click Reset Password to reset the user password to the new one you specified. This password is temporary and the user will be required to change it after first login. You can make it permanent by flipping the Temporary switch from On to Off before clicking Reset Password. After creating the user, log out of the management console by clicking the right dropdown menu and selecting Sign Off. Type the username and password you created previously. You must create a permanent password after you successfully log in if you didn’t toggle the Temporary switch to Off previously. The User Account Service page opens. Every user in a realm has access to this Account Service by default. You can update profile information and change or add additional credentials. For more information on this service see the Server Administration Guide. 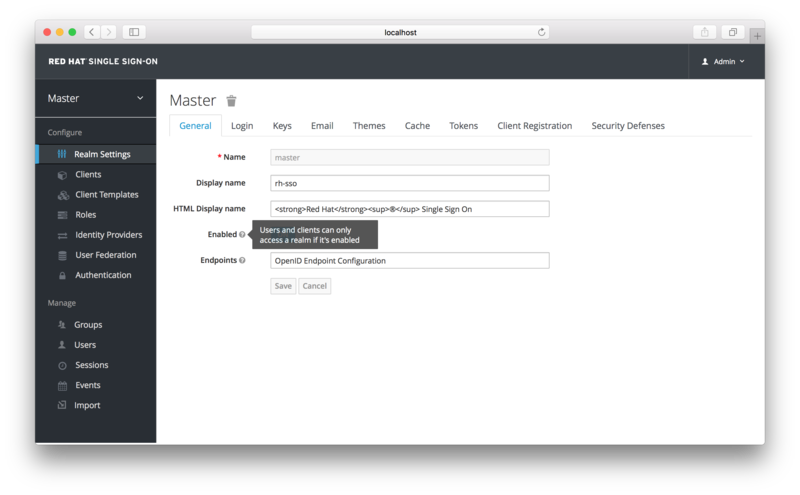 Before you can participate in this tutorial, you need to complete the installation of Red Hat Single Sign-On and create the initial admin user as shown in the Installing and Booting tutorial. There is one caveat to this. You have to run a separate JBoss EAP 7 instance on the same machine as the Red Hat Single Sign-On server. This separate instance will run your Java Servlet application. Because of this you will have to run the Red Hat Single Sign-On under a different port so that there are no port conflicts when running on the same machine. Use the jboss.socket.binding.port-offset system property on the command line. The value of this property is a number that will be added to the base value of every port opened by the Red Hat Single Sign-On server. Next download the RH-SSO-7.1.0-eap7-adapter.zip distribution. 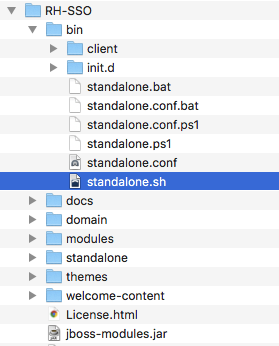 This script will make the appropriate edits to the …​/standalone/configuration/standalone.xml file of your app server distribution. Finally, boot the application server. You can obtain the code by cloning the repository at https://github.com/redhat-developer/redhat-sso-quickstarts. 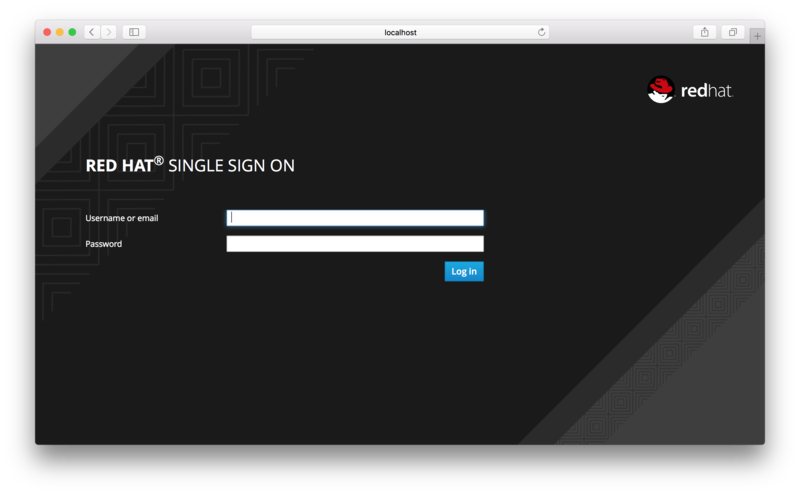 Use the branch matching the version of Red Hat Single Sign-On in use. Follow these steps to download the code, build it, and deploy it. Make sure your JBoss EAP 7 application server is started before you run these steps. The next step you have to do is to define and register the client in the Red Hat Single Sign-On Admin Console. Log into the Admin Console with your admin account as you did in previous tutorials. In the top left dropdown menu select and manage the demo realm. Click Clients in the left side menu. The Clients page opens. On the right click Create. Select Keycloak OIDC JBoss Subsystem XML. An XML template is generated that you’ll need to cut and paste. Now that you have copied the XML template from the Installation page, you need to paste this into the standalone.xml file that resides in the standalone/configuration directory of the application server instance on which your application is deployed. Go to http://localhost:8080/vanilla and click login. 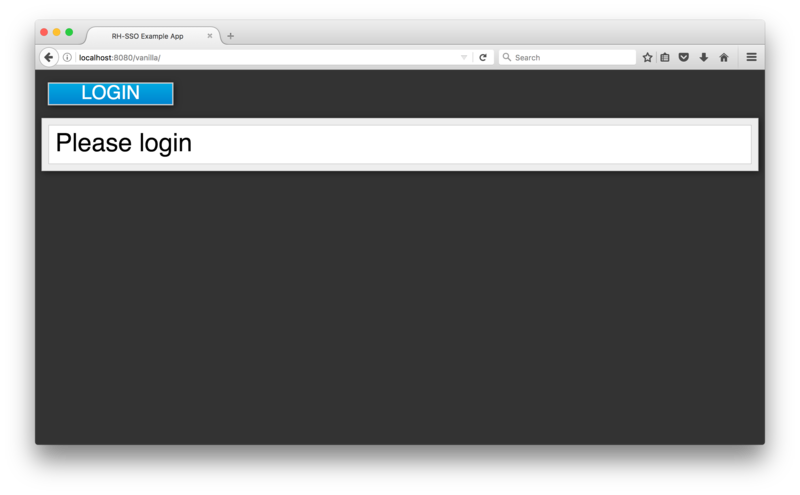 The Red Hat Single Sign-On login page opens. You can log in using the user you created in the Creating a New User chapter.